Integrity-more than simple honesty, it's the key to success. A person with integrity has the ability to pull everything together, to make it all happen no matter how challenging the circumstances. Drawing on experiences from his work, Dr. Henry Cloud, a clinical psychologist, leadership coach, corporate consultant and nationally syndicated radio host, shows how our character can keep us from achieving all we want to (or could) be. 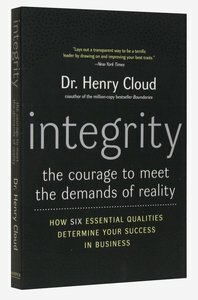 About "Integrity: The Courage to Meet the Demands of Reality"